iPad Giveaway Daily Entry! 3 more Winners! 3 more winners to go! Are you entering everyday like I am..:):) Enter daily to win an iPad from Coupons.com! One iPad a day until August 9th. All you do to enter is fill in your email address...that's it!! Please let me know if you win! 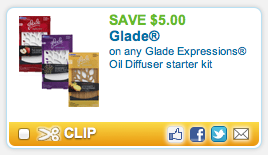 There is a great new high value Glade coupon on there today! These are on sale at Target for $5.99!! Thanks My SLC Mommy!